And we have a HUGE giveaway! You can win a $50 gift card, so don't forget to enter at the end of the post! So what do we LOVE about Fall? 1. We love the cool weather- cute boots and comfy scarves are a must! Looking forward to going Fall shopping soon! 2. Homemade Goodies- Just smelling all the delicious Fall treats makes your mouth water- apple pie, pumpkin bread, sweet potatoes, yum!!! 4. Visiting the pumpkin patch and roaming through a corn maze with family and friends are other fall favorites too! And we LOVE celebrating Fall in the classroom as well! 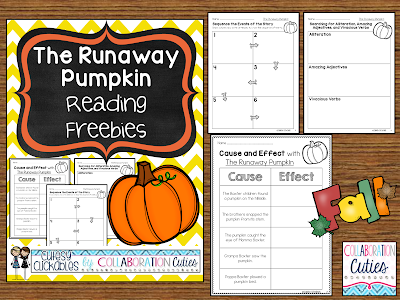 Here are 2 Fall Freebies for Reading and Math! Have you read the book The Runaway Pumpkin? It's a perfect Fall read aloud! A giant pumpkin rolls out of control down the hillside in this fun and entertaining Fall favorite! These freebies will help you teach cause and effect, sequencing, amazing adjectives and vivacious verbs. Just click the image above to download it for free! 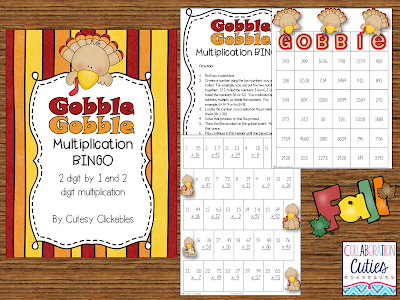 Our other freebie is a Gobble Multiplication Bingo Board- can you believe we are only a week away from November!? It's a fun game for students to practice 2 digit by 1 digit and 2 digit multiplication, and everything you need is included (except the dice of course!) Just click the image above to download it for free! 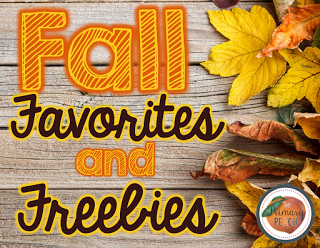 Fall Favorites and Freebies--Just Reed!